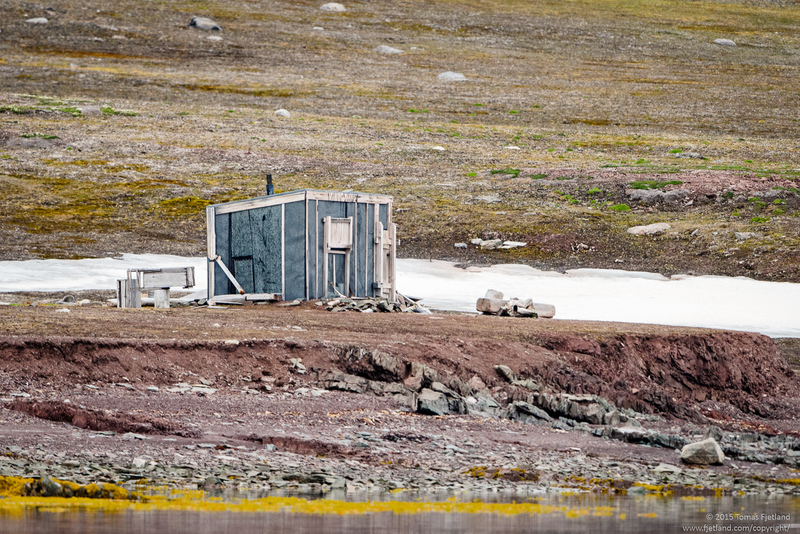 As we leave the Monaco glacier and make our way back out into the open seas, around midnight at the end of the 21st we stop close to Worsleyneset as a Polar bear was spotted on land. 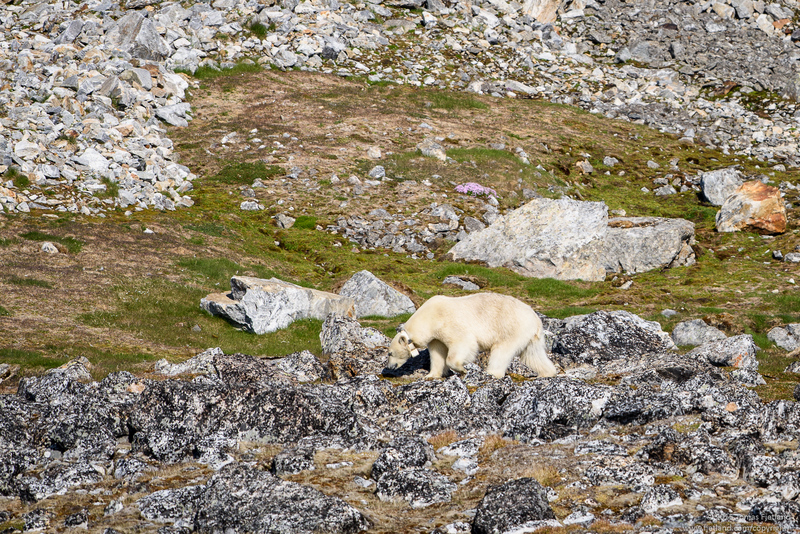 While we’re getting into the zodiacs, the bear decides to move further in land and stops next to a huge boulder. 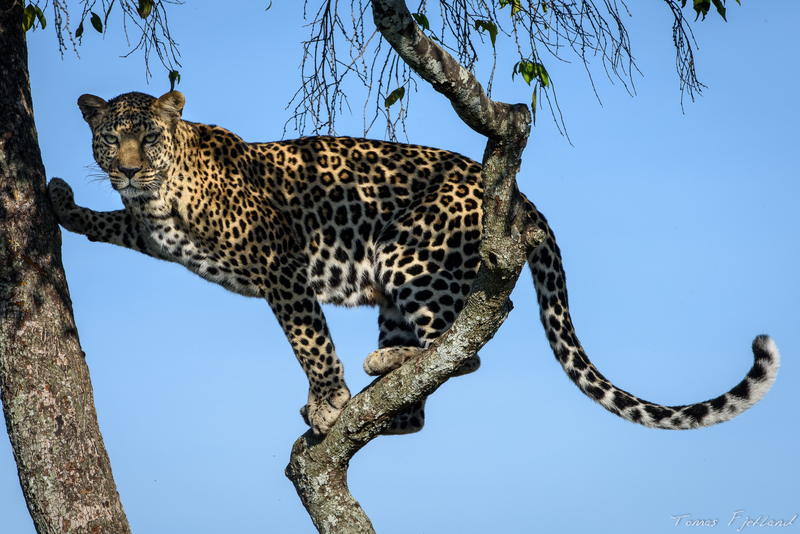 We decide to hang around for a while to see if he comes back down to the waterfront, but he doesn’t seem willing to move. Meanwhile a large number of Kittiwakes are gathering around us, diving for something in the water. I’m noticing the water is incredibly clear, and just below the surface I can see a large number of strange organisms, I assume they are really large zooplankton. We’re talking 4-5cm long and square organisms.Presumably this is what the Kittiwakes are going mad over, or it’s just a school of fish passing. While we’re sitting there waiting for the Polar bear to move, Yuzo discovers it’s wearing a radio collar, and the enthusiasm drops noticably. We decide it’s not worth the wait. Collars are hopefully useful to science and will help the Polar bears in the long run, but they do not make their hosts very photogenic representatives of wildlife. I head to bed as we make our way out of Woodfjorden and towards Raudfjorden. 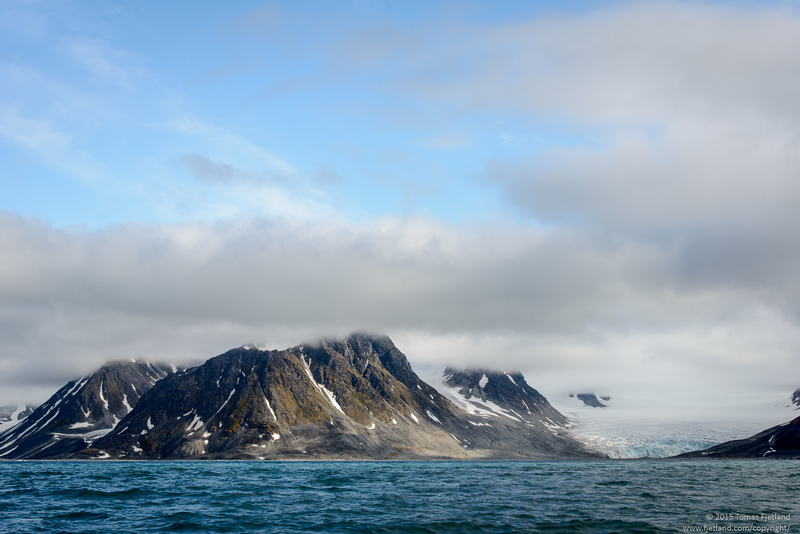 In the morning I get up early to scout as we glide through Raudfjorden, but we don’t really find anything interesting. 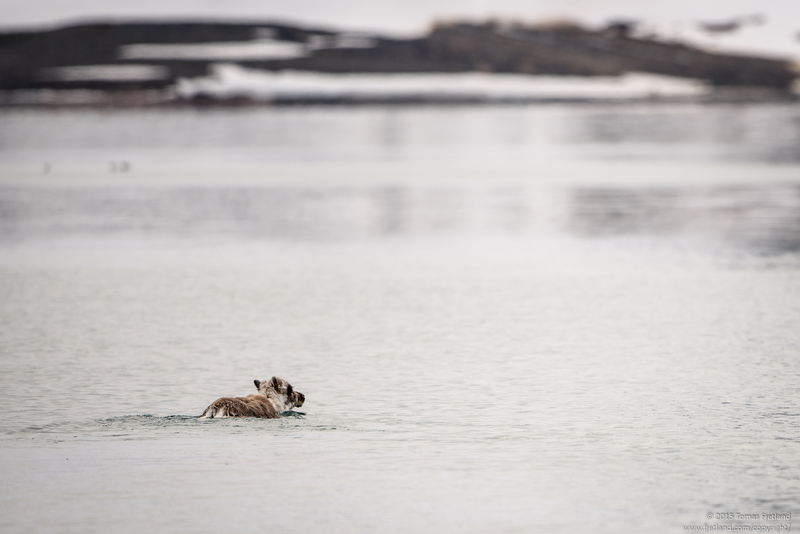 On the way out however we see a Svalbard reindeer swimming right across the fjord. Raudfjorden isn’t a small fjord, so that’s quite a swim. She seems to have no problems though and keeps good speed. A few hours later we reach Nordvestøyane, where we leave Origo in the zodiacs to do a cruise down to Fuglefjorden, and then catch up with Origo on the other side of Fugløya. Right after we enter the zodiacs we’re surrounded by a large group of Belugas. These completely white whales are suddenly all around us. 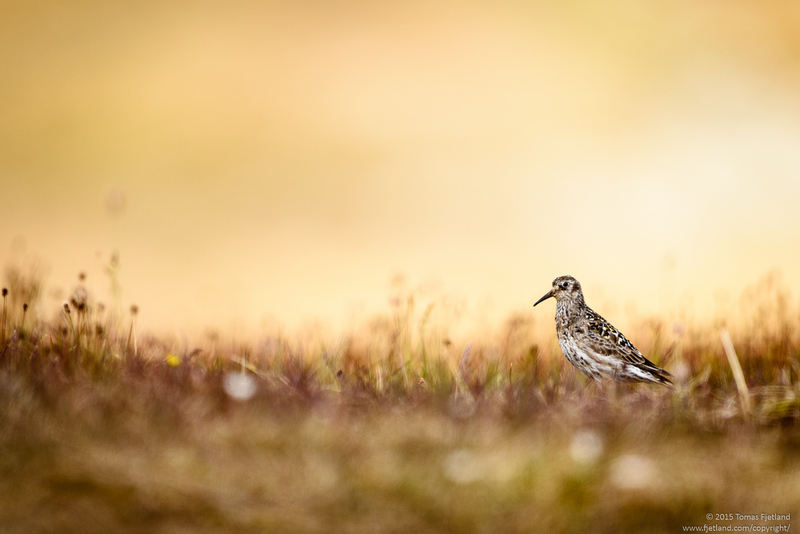 The group consists of mid sized and small individuals, so we assume it’s a group of females with calves. Once they’re happy checking the zodiacs out, they continue over to Origo, until they make their way onwards. Unfortunately Belugas aren’t as cooperative as some of their fellow whales when it comes to sticking their heads out of the water, so photographically, there’s a lot of arched backs and blowholes and not much else. The experience is amazing, though. They keep swimming around our boats, which are about the same size as the largest females in the group, obviously curious. We make our way to the end of Fuglefjorden, to the impressive glacier edge there, and then back out. 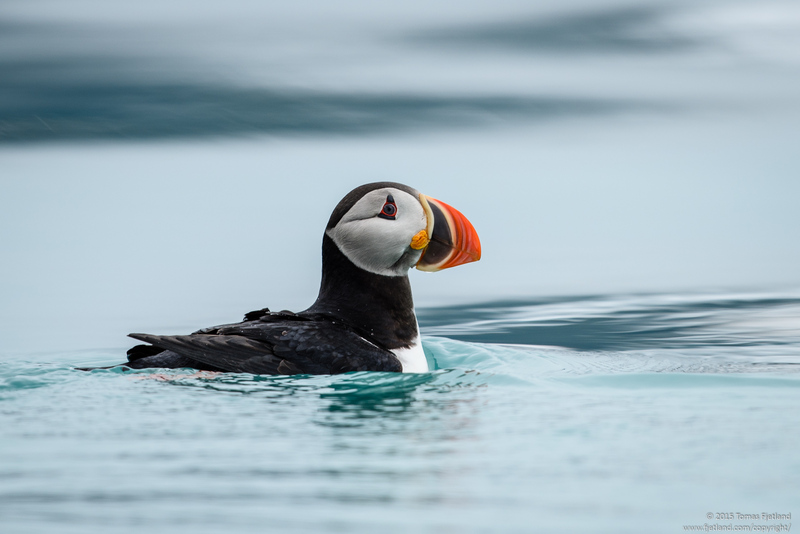 We come across a few Puffins, but otherwise there’s not a lot of animal life there. After meeting Origo again south of Fugløya, we continue south back to Magdalenefjorden where we stopped on our way northbound early in the expedition. 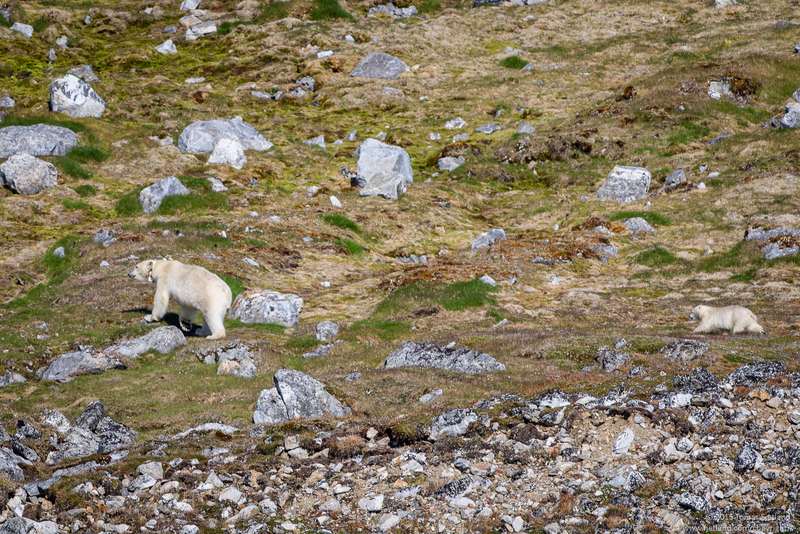 Just into the fjord, in the slopes at the foot of Ytstekollen, we spot a Polar bear female with a single cub. Boarding the zodiacs again, we try to get closer, but she’s on the move, and the distance between us and her is too get very good shots. Between the inverted mirage effect, the distance, and the zodiacs constantly bobbing up and down in the waves, it’s amazing I came away with some shots where you can tell there’s a bear or two in the frame at all. As she moves further in land with the cub, we’re visited by a new group of Belugas, probably a group of males. While the weather is noticably better, it doesn’t make Belugas any easier to get any worthwhile pics of. But hey, it’s Belugas, right!? Not something you see every day. So I included a few anyway. 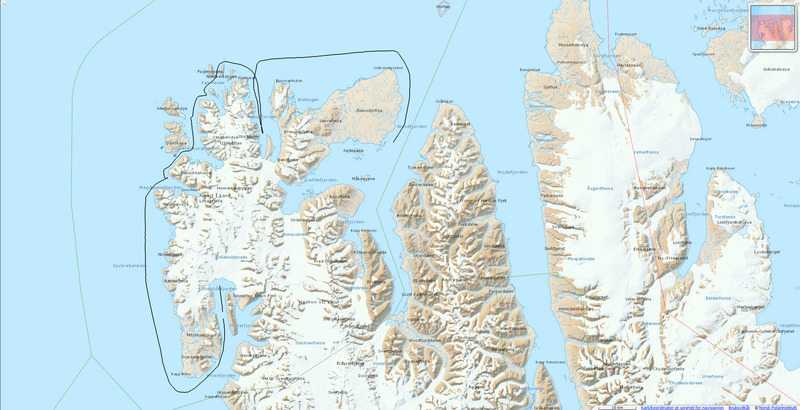 Since the Belugas got tired of us, and the Polar bears moved out of sight, we returned to Origo and continues south, towards Kongsfjorden. Having spent most of the day in the zodiacs, it took a while before my back stopped moving back and forth on its own to compensate for imaginary boat movement.